In the heart of Colorado lies South Park, an area that manages to encompass all that is Colorado and bears little resemblance to "South Park," the Comedy Central TV show — but is a magical destination for those seeking pure Colorado beauty. With 14,000-foot peaks, a rolling and colorful river valley, mining history, twisting and ancient bristlecone pine and abundant wildlife the real South Park in Colorado's Park County is one of the state's most beautiful designated heritage areas and is home to the towns of Fairplay, Alma and Como. One of our favorite Centennial State drives sweeps drivers from atop Kenosha Pass and swoops them down into the South Park valley, where they find a delightful contrast of green ranchland, oxbowed creeks and soaring, snowcapped mountain summits. The term South Park was first used in the 1840s by hunters and trappers who traversed the Rocky Mountains. Ten years later, word spread across America of three successful gold strikes in Colorado (Check out Colorado Ghost Towns for other Gold Rush-era relics). Fortune seekers flocked to the area and gold camps sprang up overnight. From 1860-1863, Park County boasted $1.5 million in gold extraction. By the 1880s the area was known for its mineral springs, hunting, fishing and wildflower meadows. In the days of the early pioneers, hopeful gold prospectors fanned out across the area. The town of Fair Play was established in 1859 at the junction of Beaver Creek and the South Platte River, and served as a supply center for nearby mining camps. Fair Play was rechristened as South Park City in 1869, then changed back to Fairplay (one word) in 1874. As the mining industry faded, tourism, along with cattle-raising and hay-growing, became the economic mainstays of the area. Known today as the Trout Fishing Capital of Colorado, anglers seek out the area's Gold Medal streams. And in 2009, South Park and the area around Fairplay were designated a National Heritage Area by the U.S. Congress for its distinctive landscapes, historic structures, recreational resources. 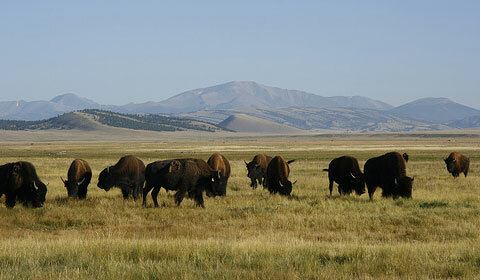 Traveling around, you'll see South Park's 19th-century ranches, old mines and other historic sites. On the edge of Fairplay lies South Park City, an extraordinary museum with 40 historic buildings. It was created in the late 1950s by a group of citizens concerned that the old mining and ghost towns of Park County were being dismantled and destroyed. The group recreated an 1800s gold mining town. Buildings were brought in from the high gulches of the Mosquito Range and from mining towns such as Alma, Leavick, Buckskin Joe and Montgomery. Most of these buildings showcase an array of period furnishings and equipment, and tours take you back in time to South Park's early days. Alma, northwest of Fairplay, once served as the ore-processing center of South Park and once numbered 900 residents. The commercial district also served as an entertainment district, because the manager of the Moose Mine would not allow saloons or gambling in Dudley — a town located just a mile away. Today many visitors chuckle at a sign above a local drinking establishment that says: Alma's Only Bar. Before leaving town, catch a glimpse into the life of the early pioneers at Alma's cemetery. One stone is carved with a cryptic message: "I love you but please go to sleep." Today Alma welcomes mountain-hiking enthusiasts, ghost hunters and tourists from Leadville and Breckenridge. Must-sees include Kite Lake, at a crisp 12,400 feet and the ghost town of Buckskin Joe. The four-wheel-drive Mosquito Pass, the highest motor-vehicle pass in North America, above Alma is the area’s most popular summer attraction. Also above Alma may be one of the most interesting spectacles in South Park — the Bristlecone Pine Scenic Area. You can drive part way to the site, then hike the remainder in summer or ski it in winter. Standing on a barren bluff overlooking the valley are 2,000-year-old bristlecone pine trees, gnarled into grotesque beauty by the wind. Delve into more Colorado history in Como, a tiny community with several 1800s-era buildings, including a church, hotel and the recently restored Como Depot — once an integral stop of the Denver, South Park and Pacific Railroad. For delightful canyon views, stop in Bailey, where you can stretch your legs in 20-acre McGraw Memorial Park. Pop into the Bailey Country Store and Sasquatch Outpost for some local flavor, then to Lost Creek Wilderness for fascinating red-rock formation, granite domes, spires and more.